Latvian low-cost flag carrier airBaltic saw its net profit drop by more than 16 times year-on-year in 2016 to 1.2 million euros, and its yields decreased by 6% to 88.7 euros per passenger seat. The carrier’s income remained roughly level with the previous year, increasing just 0.4% to 286 million euros. Its passenger traffic grew 11.5% to 2.9 million, an the load factors increased 3 percentage points to 74%. Despite the dip in revenues, airBaltic remains optimistic. The carrier’s management is confident that the hybrid low-cost model will increase its competitiveness on the European air travel market. The airline expects to see its passenger traffic grow further after it takes delivery of more Bombardier CS300 airliners. airBaltic is set to bring its CS300 fleet up to 20 airframes in the next three years, and to hire approximately 200 new personnel by 2018. Earlier this year the Latvian government selected a strategic investor for airBaltic. The new partner, which is to start in the role by the end of 2017, is expected to provide the airline with access to long-haul flights. The carrier is currently unable to serve several important destinations, including for lack of the right aircraft types in its fleet. The airline does not disclose its strategic partner, but the management said earlier there were plans to offer airBaltic as a feeder carrier to major European holdings such as Air France-KLM, International Airlines Group (IAG), or Lufthansa. Other, smaller operators could also be interested in acquiring a stake in the carrier. Another possibility is to partner with a major Asian, Middle Eastern, or US airline. As per the carrier’s five-year strategic plan, airBaltic is to strengthen its positions in the Baltic region and neighboring countries. Its traffic is expected to reach 4 million passengers, and its fleet is set to expand by 30% to 34 aircraft. The carrier currently operates 25 airliners: two CS300s, 11 Boeing 737s, and 12 Bombardier Q400NG regional turboprops. An 80.05% stake in airBaltic is owned by the Latvian; the remaining part is controlled by German financial investor Ralf-Dieter Montag-Girmes via Aircraft Leasing 1 SIA company. Latvian newswire LETA recently reported that Danish businessmman Lars Toesen is interested in buying out the minority stake. An earlier agreement called for Montag-Girmes’s shares to be bought out once a strategic investor had been found. The government, in the meantime, does not rule out selling its stake to a potential buyer “in good strategic shape”. 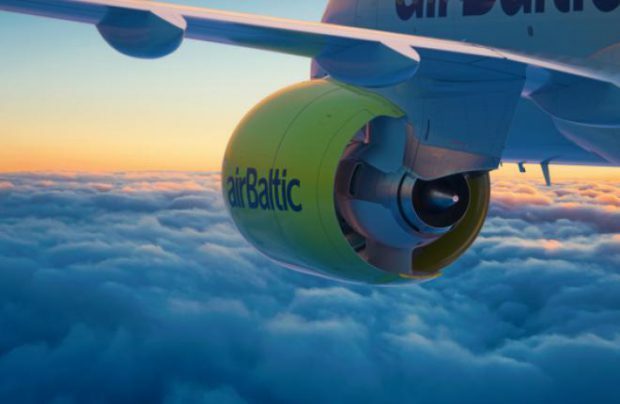 AirBaltic connects the three Baltic countries with other EU members states, the Middle East, and the CIS. Its route network comprises 60 destinations.